The word of the day is “pastacoma” and I’m in one. 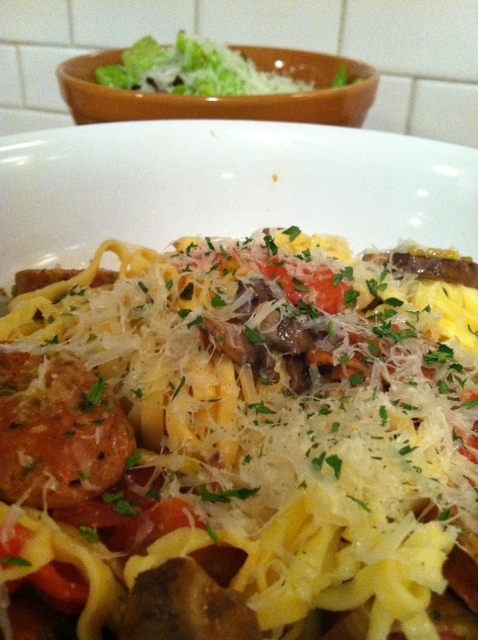 It’s a trance and I have been thinking about pasta all the time lately. 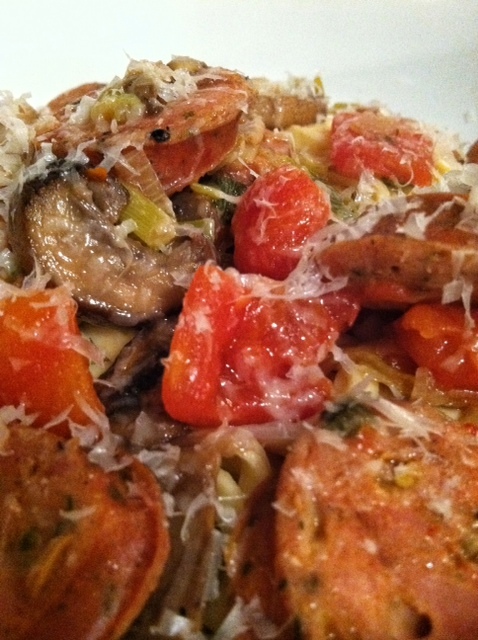 This pasta dish was different than any of the others I make. 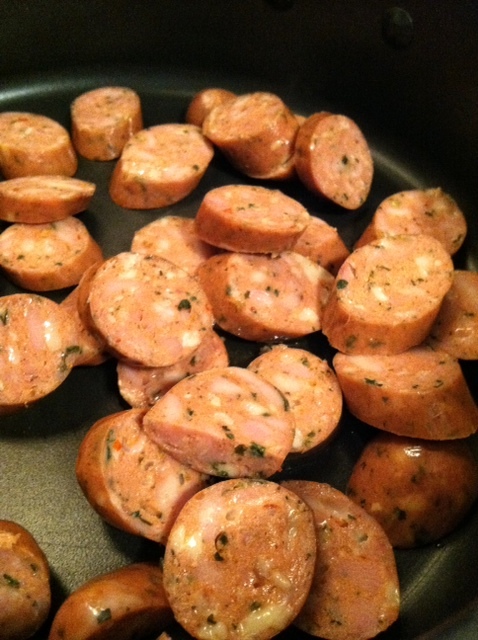 I am trying to teach myself to like Italian sausage. Do you ever try to train your taste buds? It usually works for me. Then I will eat the thing I am trying to train myself to like so often, that I get sick of it. Ha! 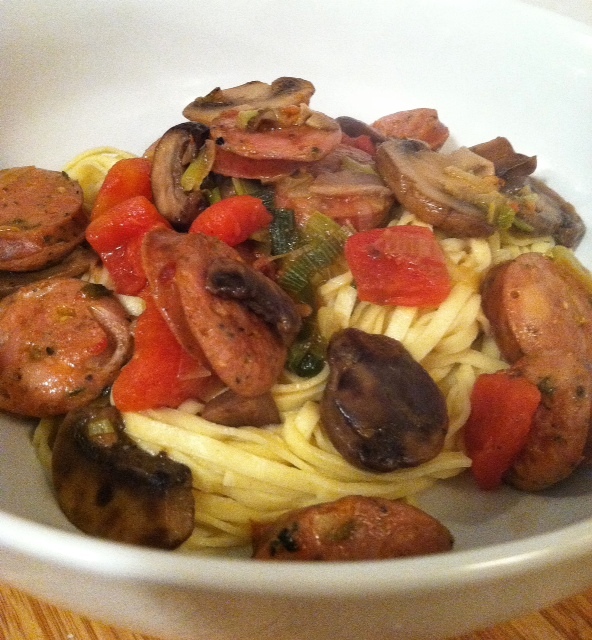 This time I used Aidelle’s Italian style chicken sausage and it was good. The ingredients here are simple and come together quickly. 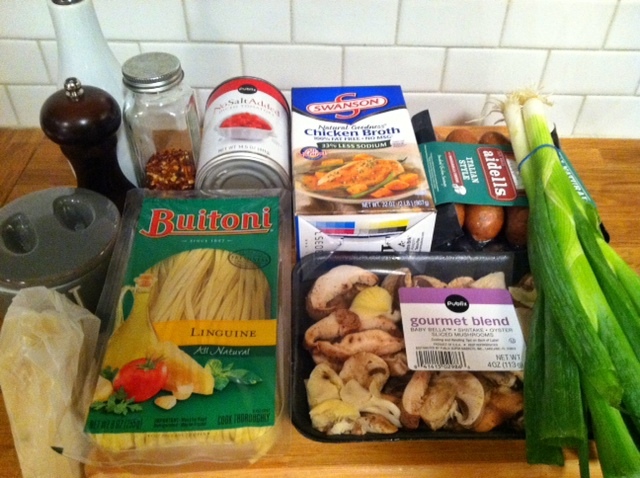 Mushrooms, green onions and tomatoes made this pasta hearty and bright. There wasn’t really a sauce to the pasta but the broth and all the juices from the sausage and veggies helped coat the pasta. I liked using the fresh pasta from the fridge case too. Fresh pasta is more expensive than dried pasta but it was a nice treat. We also don’t usually use “white” pasta so that was fun too. Topped with Parmesan cheese. 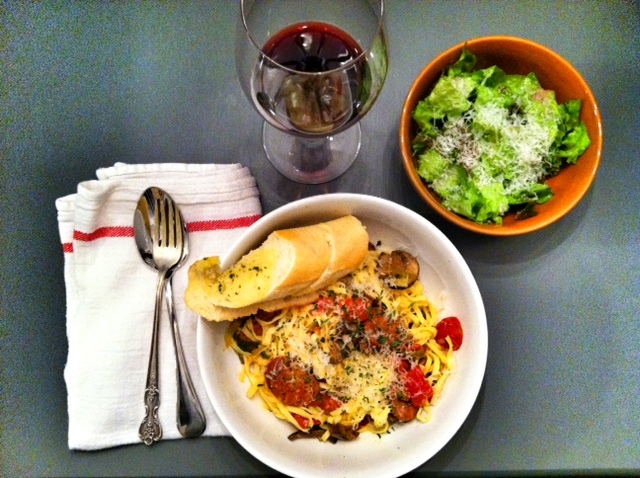 Have I posted on the importance of grating your own Parmesan? It really makes a huge difference. Here is the grater I use. Makes a great stocking stuffer! Bring a medium pot of salted water to a boil. Meanwhile, heat the oil in a large, heavy skillet over medium-high heat until shimmering hot. 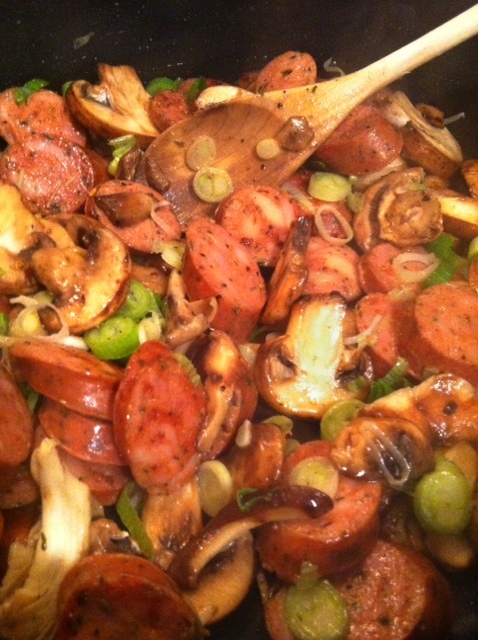 Add the sausage and cook, stirring occasionally, until browned, about 3 minutes. Add the mushrooms, scallions, rosemary, red pepper flakes, 1/2 teaspoon salt, and 15 grinds fresh pepper and cook, stirring often, until the mushrooms soften and start to brown, around 5 minutes. Add the tomatoes and chicken broth, bring to a boil, and then reduce to a gentle simmer. 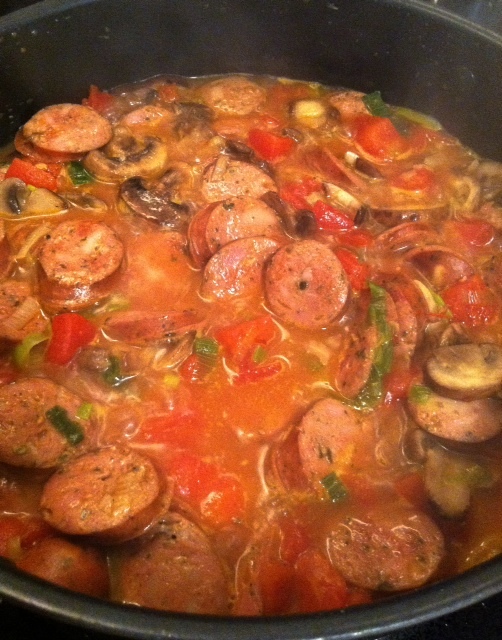 Cook until the sausage is heated through and the flavors are combined, about 5 minutes. Season to tasted with salt and pepper. Meanwhile, cook the pasta according to package timing until it’s just al dente. Drain well and add to the sauce along with half of the Parmesan. Cook over medium heat, tossing for 1 minute. Serve sprinkled with the remaining Parmesan and some black pepper.